C# enforces type safety in that it limits you to interacting with an object in ways that are allowed by that object’s type. C# achieves type safety through the use of both static typing and dynamic typing. (Also referred to as “static type-checking” and “dynamic type-checking”). Static typing is the process of enforcing type safety at compile-time. The compiler prohibits certain operations, based on the type of the objects involved. 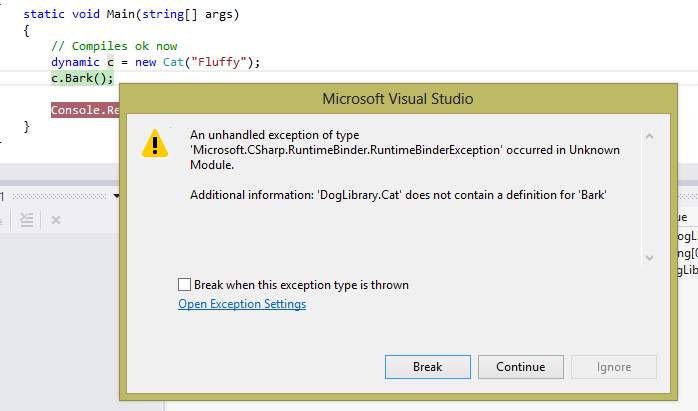 At compile-time, the compiler flags an error when we try to call the Bark method on our Cat object. Most type safety is enforced in C# at compile-time (static typing). Dynamic typing is the process of enforcing type safety at run-time, rather than compile-time. Type-checking can be delayed until run-time by using the dynamic keyword.